ROY model Nozzles is open (non-automatic) directional spray nozzles and they are designed for use in water spray fixed systems for fire protection appliances. They are external deflector type nozzles that discharge a uniformly filled cone of medium velocity water droplets. ROY model nozzles are effective in covering exposed vertical, horizontal, curved, and irregular shaped surfaces in a cooling spray to prevent excessive absorption of heat from an external fire and possible structural damage or spread of fire to the protected equipment. 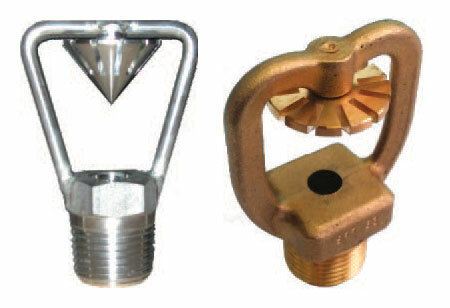 In some applications, depending on water design density requirement, ROY model nozzles may also be used for fire control or extinguishment. ROY model nozzles are available in a wide variety of orifice sizes and spray angles (included angle of discharge) to provide versatility in system design. Available material combinations are bronze or stainless steel according to request. According to the flow rate, connection to the fire network is threaded DN 15-½" or DN 20-¾", flow rates are factory calibrated up to Metric K factor 951/min * bar1/2 ROY model nozzles produce a full cone spray pattern with a wide spray angle, and provide the proper means for covering wide surfaces for cooling and/or fire extinguishment purposes. They are normally delivered with a 130° spray angle value, while different values can be supplied on request.